Fairy gardens are simple for kids to build, to make a model of a garden space for tiny creatures. This is a kid-friendly gardening project that can be created any time of the year, and played with outside in pleasant weather and inside during less pleasant days. Let me just say that if your child doesn’t care for a fairy theme, the miniature landscape and dwelling could be on any theme: for example, a little farm or horse ranch, a dinosaur landscape, an historical landscape from cavemen to a moon dwelling place. Whatever little toys your child wants to use would be just fine. When my brother and I were young, we built Lincoln Log cabins all over my parents’ rock garden, and had an ongoing imaginary ranch system, complete with rivers…until our downhill neighbor got upset with the water running into their yard. 1. Start simple, with an unneeded or broken container found around the house. The one I will show you here I made in a chipped fruit bowl. It has no drainage, which means I don’t have to worry about where water will go. Here’s what it looked like when I started. 2. 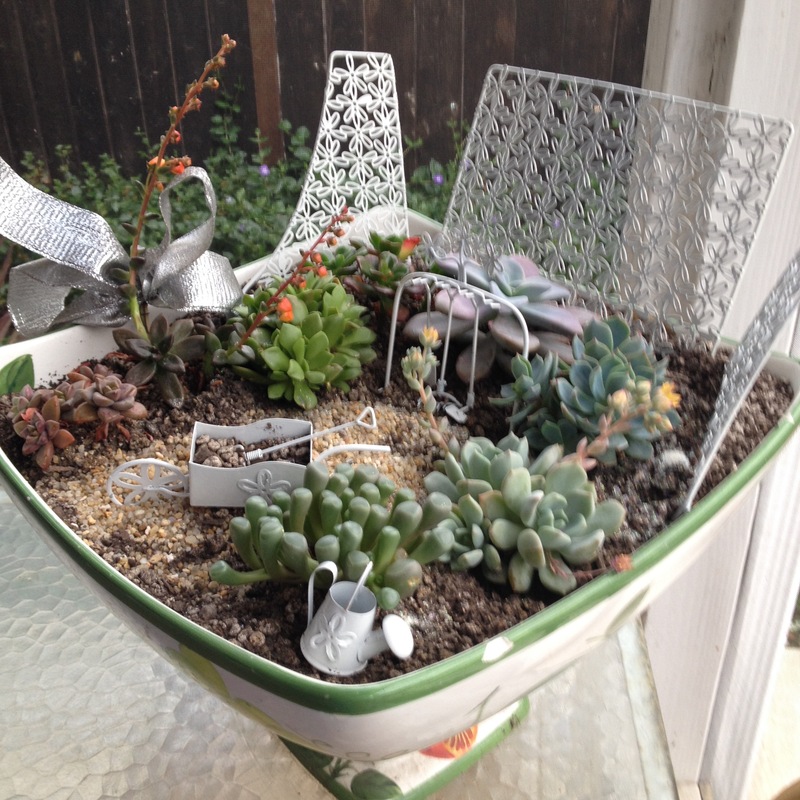 Buy little succulents, or ask to have some “cuttings” from a gardener. They actually like neglect up to a point! Succulents are not pokey, and won’t hurt a child. Some are pleasantly fuzzy. Most will flower. 3. And get a bag of cactus and succulent soil, unless you live in a desert, and have that sort of soil around. Some different textured rocks to make paths or streams can be fun, too. 4. I bought a fairy garden “kit” because I had a good coupon at a store that sold them. Later I found other items at a Michael’s craft store. You could make your own, too. I did discover that black items against dark soil didn’t show up well. I’ll use those items for another project. 6. If it is going to be in a large container, build it where it will reside. Mine lives out on a glass table on the back porch. 7. Moms, resist giving your child too many directions. If they’ve never planted a plant before, then they may need a lesson on how to do this. In a nutshell just tell them it will look best with the bigger plants in the back, the next biggest to one side, and the smallest on the third side. The front will be the entrance where the fairies, tiny dinosaurs, cowboys, etc. will enter their garden. Figure out where any building will go, if you are adding a small house. 8. Last of all, decorate it! Play with it. Move things around. It is like a real garden which changes day to day. 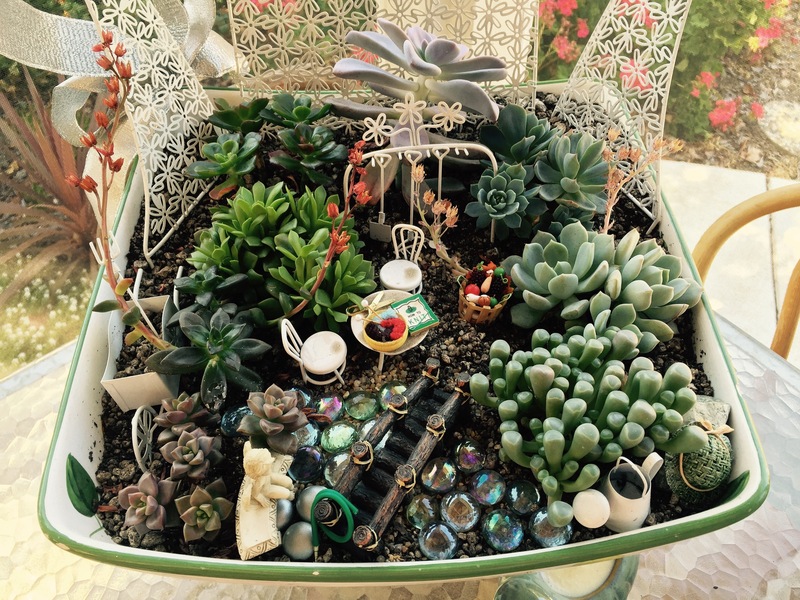 Here are some arrangements I made to my garden. Here are some other sites that will give you some more ideas about Fairy Gardens. If you’re looking for a kid-friendly gardening project this spring, consider the fairy garden. These whimsical container gardens offer kids a mini, planted playspace of their own with endless opportunity for customization and make-believe. Oh, yeah. I forgot the “cleanup” step in the list above! 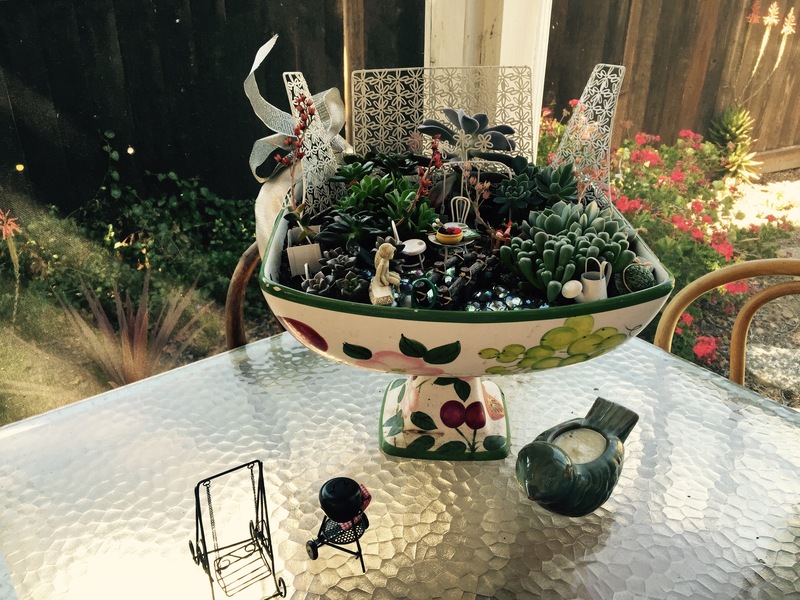 A Pinterest board with lots of ideas for fairy gardens and how to build them. YouTube with a Harley-riding grandfather who builds fairy houses from found items around his yard and some craft store materials. His tip: furnish the house before you put the roof on! A Pinterest board with ideas for making doors with craft sticks, fairies with seed pods. Inspiring step-by-step projects feature basic skills that can be recreated in any number of designs, like a tiny patio, a trellis, a pond, and a secret garden. YouTube video with a woman showing her simple fairy garden. Best seller on Amazon for fairy garden furniture.